Pop-ups have a history of being unwanted and potentially creating problems for website visitors. Due to their bad reputation, most modern Web browsers will block all pop-ups by default. This is meant to provide a means of security for users, but can be a problem if a site is trying to use a pop-up for a good reason. If you are visiting one of these sites and you need to access content that is being blocked because it’s in a pop-up, then you are able to allow that pop-up through in Internet Explorer. 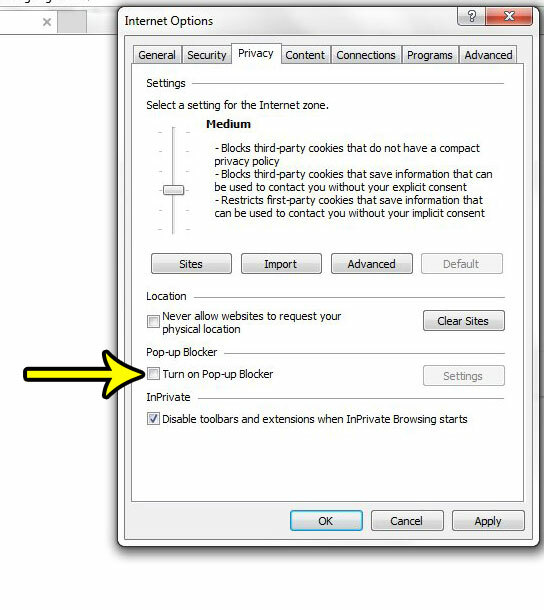 Our tutorial below will show you how to turn off Internet Explorer’s pop-up blocker completely so that you can view the pop-up. The steps in this article were performed in Microsoft Internet Explorer 11. 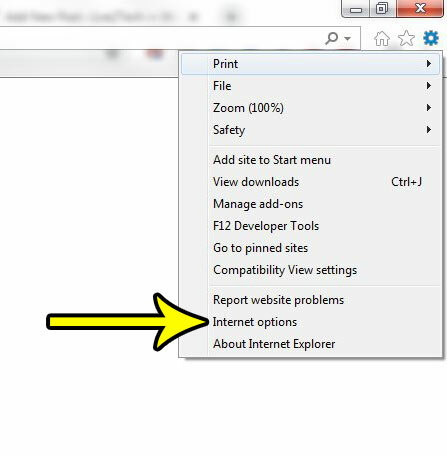 Note that once you have completed these steps, Internet Explorer will no longer block pop-ups that try to open on any websites that you visit. This can be a problem as some websites use pop-ups maliciously, so it’s best to turn the pop-up blocker back on if you only need it to access something on a specific site. Step 1: Open Internet Explorer. Step 2: Click the gear icon at the top-right of the window. Step 3: Choose the Internet Options item near the bottom of the menu. 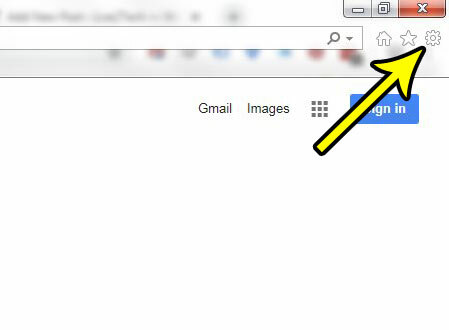 Step 4: Choose the Privacy tab at the top of the window. Step 5: Click the box to the left of Turn on Pop-up Blocker to remove the check mark. You can then click the Apply button followed by the OK button to save this setting and exit the window. Note that you can also choose to leave the pop-up blocker on, but to allow pop-ups from certain sites. You can do this by clicking the Settings button in the section above, then entering a website address for which you wish to allow pop-ups. 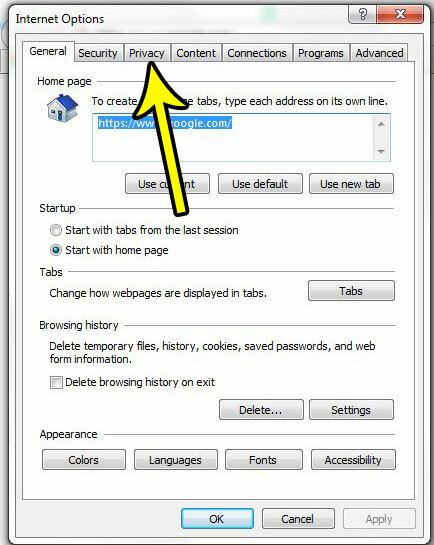 Would you like for Internet Explorer to automatically switch to a new tab when you create one? Read here to find out where the setting for that behavior can be found. Why Am I Getting a Copy of Every Email I Send from My iPhone SE?